Chiau, who won the award for his performance as the Monkey King in A Chinese Odyssey, said he was honoured to receive the award from director Hou. 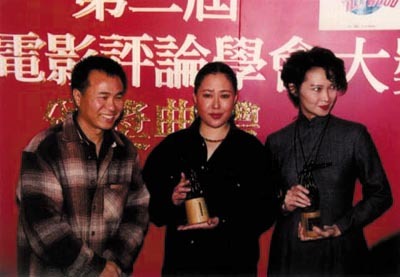 Chiau described the honours heaped on A Chinese Odyssey by the HKFCS as something that would stand up because the society 'knew their stuff': in addition to the acting award, Chiau, dressed in a Mao suit, was also on hand to accept the Best Screenplay Award (on behalf of writer Kei On) and a Film of Merit Award that were also won by the film. Siqin Gaowa rushed to Hong Kong from the Mainland to receive her award. She said she was extremely happy to share the award with Josephine Siao. In 1985, Siqin had won the Hong Kong Film Awards' Best Actress category for her performance in Yim Ho's Homecoming (1984). Nearly eleven years later, she was given another award for her performance in yet another Yim Ho film, The Day the Sun Turned Cold. Josephine Siao won hers for Summer Snow. Siao had earlier won the Best Actress prize at the 1995 Berlin International Film Festival for the same film. In her speech, Siao said that each time she made a film, it was such hard work that she would think of quitting, but each time she wins an award, she wants to continue making movies. Summer Snow won the Best Picture Award but because of Ann Hui's absence in Hong Kong, Siao and a member of the cast in the movie, Ting Tsz-chun, accepted the award on the director's behalf. Derek Yee thanked Hou Hsiao-hsien for presenting the Best Director award to him, and said he would continue to work hard. Director Tsui Hark attended the ceremony to receive the Film of Merit Award for his The Blade. The HKFCS president Li Cheuk-to presented this category of awards. 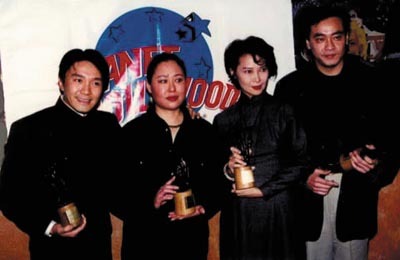 Two productions of the Po Yiu Company, The Day that Doesn't Exist and Once in a Life Time were also awardees in this category. Directors Wellson Chin, Ko Lam-pau, writer Abe Kwong (also the producer), turned up to receive their awards. In their speech, they said they were satisfied with the progress of Po Yiu over the past year. Other films mentioned as Films of Merit were A Chinese Odyssey, Fallen Angels, The Case of the Cold Fish, Full Throttle, and The Day the Sun Turned Cold. Hou Hsiao-hsien flew specially from Taiwan to Hong Kong to preside the ceremony. He rushed straight to the Planet Hollywood upon arrival. Because he was busy editing his new film, Hou could only stay one day in Hong Kong. HKFCS president Li Cheuk-to expressed his gratitude to Hou Hsiao-hsien for presiding over the awards ceremony. The HKFCS awards are the only awards given out by the territory's film critics and awarded purely from the critical perspective. Work on the selection of award winners and the presentation ceremony commenced over two months. This is the second edition of the HKFCS awards; the voting process for the awards took eight hours in a plenary session of members. There are 40 members in the society, an active and decisive force in the film-criticism community of Hong Kong.